NUB Application - How is this created and what should I consider? New examination and treatment methods (NUB, regulated in § 6 (2) KHEntgG) include methods and procedures of examinations and treatments that do not exist in the health market or have no appropriate reimbursement. Click through the process steps and get comprehensive expert information about the NUB application procedure. New examination and treatment methods (NUBs) comprise of novel and innovative medicines, medical products and procedures which can be applied by the hospital, i.e. inpatient procedures, before they can be settled via flat rates or additional charges (KHEntgG). In order to integrate new examination and treatment methods into the G-DRG system, the NUB application procedure was introduced for the first time in 2005. For this purpose, NUB applications can be submitted to the German Institute for the Hospital Remuneration System (InEK) within a certain period of time. 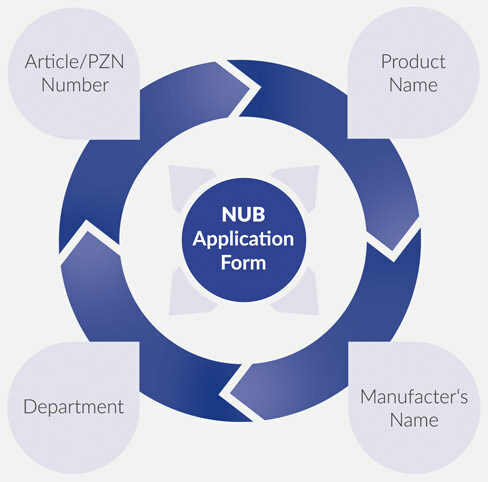 A prerequisite for a NUB application is the completed approval procedure (CE) for medical products. With the CE marking for medical devices, it is possible for the inpatient sector to use these products. In this case the “permission with reservation of prohibition” always applies. This means that the use of the product is possible at the discretion of the medical staff, as long as the joint Federal Committee (G-BA) has not explicitly prohibited its use. The creation and approval of a new medical device is associated with many costs, which should now be reintroduced as far as possible via a lively sale. The price calculation is carried out by the medical device manufacturer. However, the amount of the reimbursement, without an initial NUB procedure, is first determined by the costs of the already established comparative therapies. These are usually more favorable than the calculated costs for the new therapy option. Thus, an economically balanced use in the hospital is often not given. In order to keep the contributions of insured persons stable, only those procedures which have a verifiable additional use or additional benefit in contrast to established procedures are to be considered as NUB procedures. From 2016, this additional use or additional benefit will also be tested by the G-BA for procedures involving high-risk medical devices (§ 137h SGB V). In the case of medicinal products, imminent authorization (EMA – typically within half a year after application), as well as having significant additional costs not shown in the G-DRG system, are essential criteria for an application. In this case as well, there must be a verifiable additional use or additional benefit for the patients. If the mode of action does not differ from the existing therapeutic possibilities, it is a so-called me-too innovation, which leads to rejection of the NUB application procedure. Our team of experts will gladly assist and advise you on the preparation of your analyzes. Call now for a 15 minute telephone consultation free! What is a NUB application? The NUB application procedure serves to close the systemic gap, which consists of the incorporation of innovative medical products into the G-DRG system. This usually takes three years. Submitting hospitals must record the so-called NUB charges for the new examination and treatment method in the annual budget negotiations, as long as the application has been assessed by the InEK with a corresponding status. This can be done in the context of annual budget negotiations, but also in an isolated NUB negotiation, e.g. at the beginning of the year. NUB charges are extra budgetary and represent the possibility for the hospitals to generate additional, so-called extra budgetary revenues. Who can submit NUB applications to InEK? Since the introduction of the procedure in 2005, it is incumbent exclusively on the service providers to submit NUB applications to InEK for innovative procedures without proper reimbursement. Only those service providers who have submitted a NUB application for a new method of examination and treatment within the defined period can enter the final remuneration negotiations with the cost suppliers at the country level. The application must be submitted annually via the InEK data portal from the beginning of September to the 31st October by the service providers who wish to use the new procedure. The publication of the lump sum catalog and the definition manual should be awaited before the follow-up submission is made to a NUB from the previous year. If the examination/treatment method is listed in the updated standard package listing in the form of an additional fee, a new follow-up application is not necessary. It is also a good idea to take a look at the definition manual. If the NUB has been included in a case flat rate (DRG), then again a follow-up submission is no longer necessary, as the DRG is adequately depicted. At the beginning of the following year (end of January to beginning of February), the applications submitted, indicating the status and the number, will be published by InEK.